Samara Private Game Reserve – Mountain Retreat is situated in the malaria-free Eastern Cape where time stands still, inviting you to pause, breathe and reflect. Discover the Africa one always dreams and reads about, with spectacular sunsets and starry skies, surrounded by 70 000 protected acres in the Great Karoo. Secluded, wild and remote, Mountain Retreat surveys an ancient landscape. There are three double en-suite bedrooms in the homestead and a further two en-suite bedrooms in the restored Victorian wagon house. A comfortable lounge with fireplace and TV, and a dining room complete the indoor facilities. A wide wrap-around veranda provides the perfect area for relaxing while contemplating the awesome view. A Jacuzzi on the veranda and a Karoo-style plunge pool afford ideal cooling off spots. Essential power is provided by a generator. Indulge in the delectable offerings of our Karoo kitchen; food which is influenced by the past, but with a modern twist. Free of the restrictions of the Big 5 reserves, your professional guides will introduce you to the highly endangered cheetah, enabling you to participate in exclusive interaction with these graceful predators. Discover the secrets of Samara as you explore the untouched Plains of Camdeboo, viewing magnificent herds of antelope, or gaze down on the same plains from the mountain plateau where the endangered Cape mountain zebra have found safe haven. Fossils that pre-date the dinosaurs and well-preserved Bushman paintings offer a fascinating insight into some of the historical intricacies of our Earth’s past. 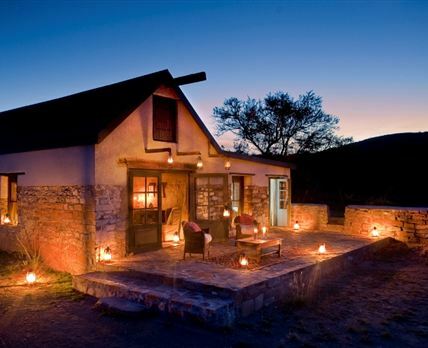 Click here to enquire at Samara Private Game Reserve – Mountain Retreat.